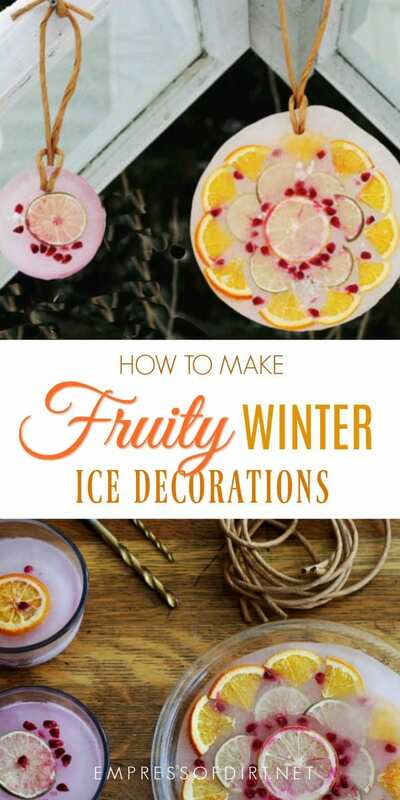 This tutorial shows how to make ice decorations with citrus fruits (or anything you like) to freshen up the winter garden. 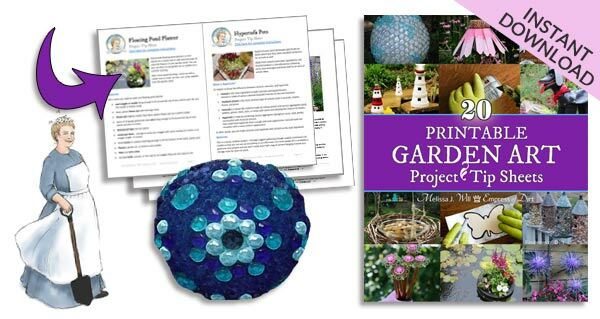 You can find lots more creative garden art projects here: Garden Art Projects. 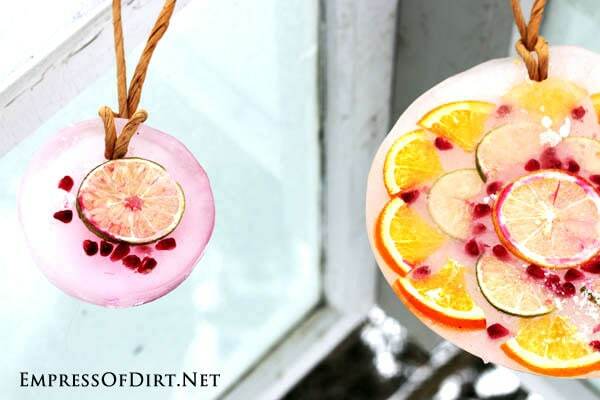 When life gives you citrus fruits and freezing cold weather, make ice decorations! 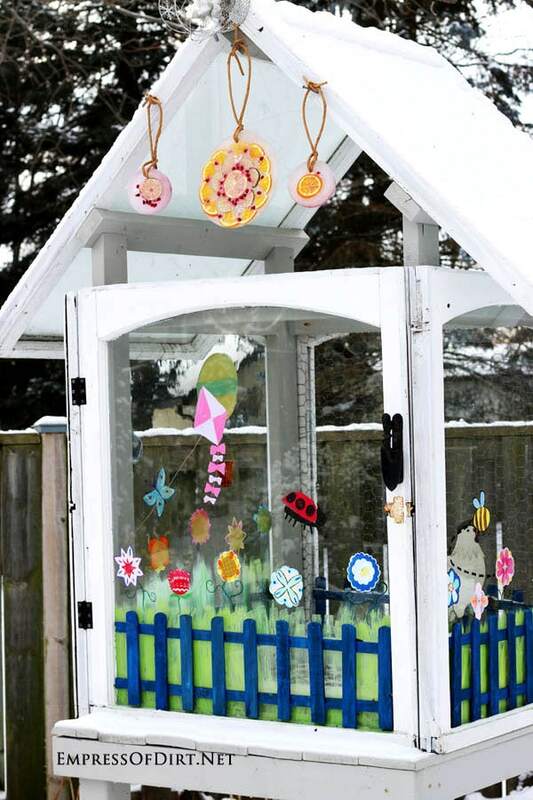 This project is a fun way to use up fruits and flora and add a burst of beauty and colour to the winter garden. 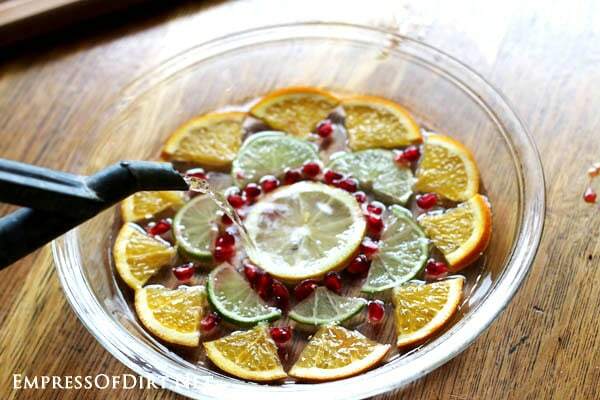 I used lemons, limes, oranges, and pomegranate seeds, but the sky is the limit. 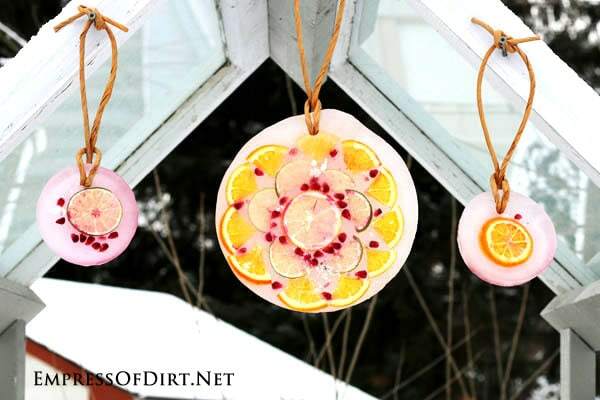 You could also use twigs, leaves, flowers, pinecones, and any other natural materials. A fading bouquet of flowers would be ideal. I’ve also seen it done with things like small toys and ornaments. 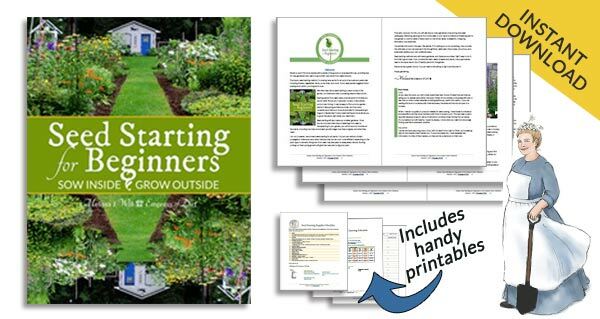 Just be sure you select items that are ok in the garden once the melting begins. I like the fruit because the birds will enjoy it as the weather warms up. 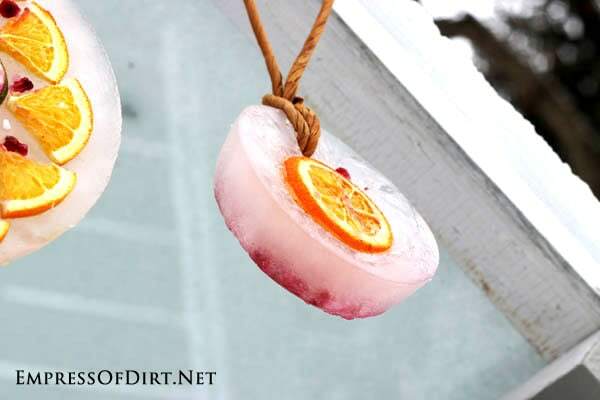 Remember, this project requires freezing temperatures outdoors, so create it when winter is doing its thing. You can use these same steps to also make things like ice lanterns and statues, which look totally amazing lined up along a walkway. Some links go to my affiliate account at Amazon.com. 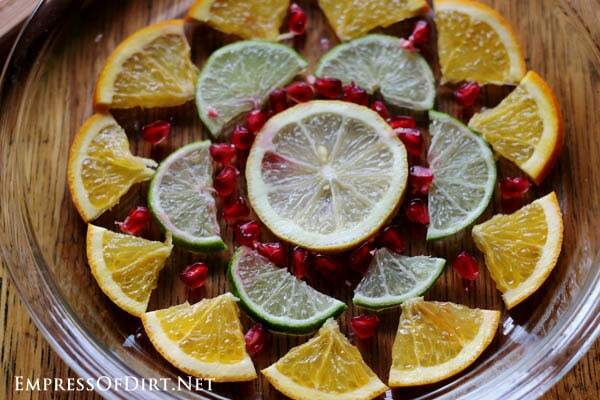 I wanted to create a medallion so I sliced the fruit quite thin and quartered it into equal-sized pieces. Be sure to pick a dish that is freezer safe. Other design ideas: spell letters, draw a primitive picture, or make a bunch with each one representing a symbol or a person. I also made mini ice ornaments in freezer safe food storage containers. Make sure there is space in your freezer first or prepare a nice level area. If it’s below freezing outdoors, you can ‘set’ the decorations outside. 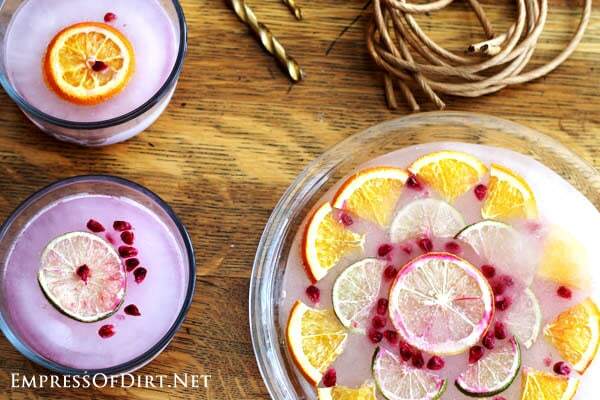 If you don’t want the fruit to move around, set everything in place, put the dish in the freezer (or outside), and then gently add the water (instead of adding the water and then carrying the whole thing to the freezer). Cover the fruit plus an extra half inch. This takes just a couple hours in a kitchen freezer. 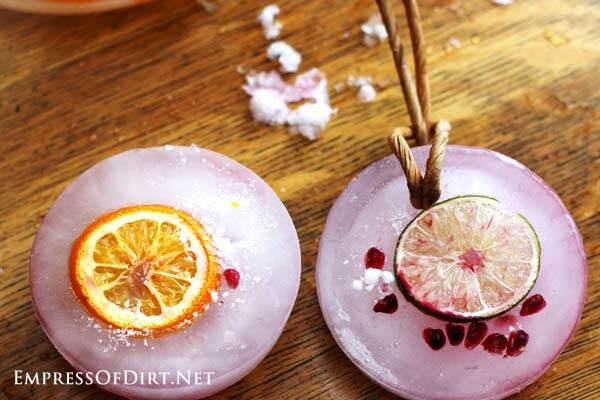 The ice decorations should release really easily from the dishes if you simply warm them slightly. 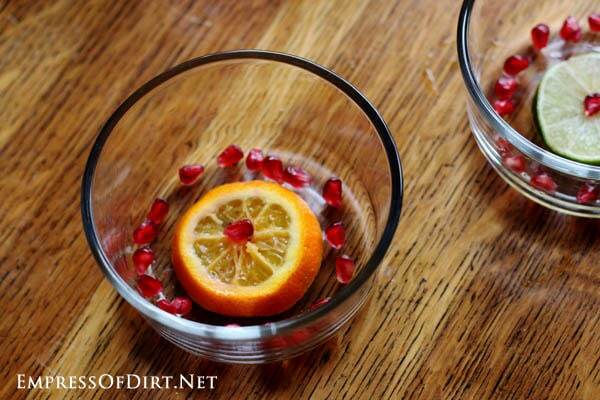 One option is to put some warm water in a sink and set the dish into it. 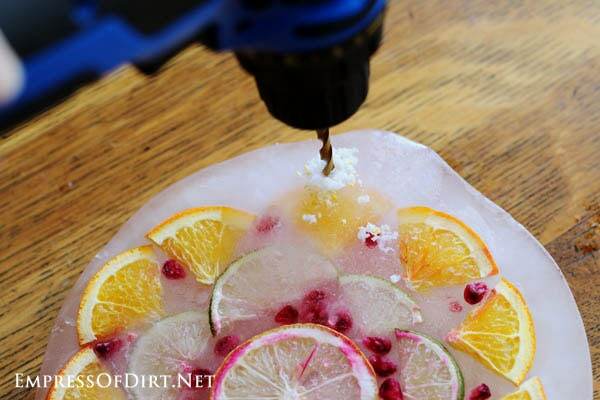 Gently turn the ice decoration with your fingers and it will release. First gently drill a pilot hole (I used a 3/16 drill bit) and then create a larger hole with a bigger bit (so you can thread the twine through). You could also create the holes manually with an awl. I actually used rush twine (used to make rush seats on chairs) because I own about 8000 feet of it, but any twine or ribbon is fine. Just be sure to use something that will hold up outdoors and looks good (of course). I folded my twine in half, threaded a loop in through the back of the ice decoration to front, and then threaded the rest of the twine through the loop. 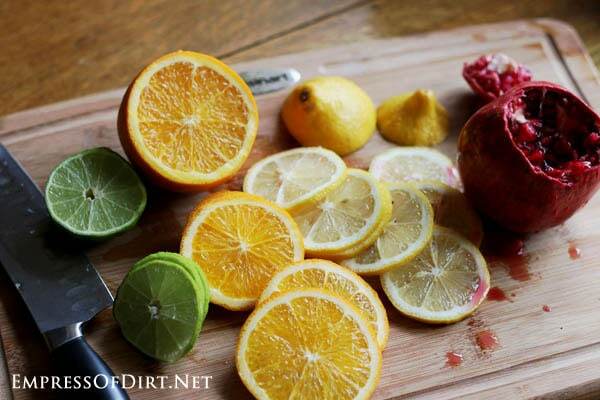 I love all things citrus in the winter. Perhaps it all started when Laura Ingalls got that orange with her Christmas gifts…. I hung these decorations from my mini green house (made from old windows), which has become my go-to place for quirky outdoor decor. And definitely adds some colour to the monochromatic winter garden. If you make some, I’d love to see pictures.